About Regenerative Medicine | Healios K.K. There is a significant paradigm shift taking place in pharmaceutical development. Traditionally, most drugs have been “small molecules” produced by the synthesis of chemical substances. Now, however, the market for biologics that use biological materials produced inside the human body is expanding rapidly. A representative example of a biologic is one that uses antibodies (proteins), which provide an immunological function. Among these biologic treatments, clinical trials have begun for new treatment methods such as cellular therapy, which makes use of cellular material itself, and regenerative medicine, which aims to rebuild structures and organs. These treatments are now moving step by step towards practical application. Regenerative medicine, using materials such as stem cells, aims to treat the loss or dysfunction of structures and organs by regenerating them, thus restoring lost bodily function. There are possibilities that this will develop into treatments for diseases that are difficult to treat with existing medicines, and for those in which treatment methods have not yet been established. iPS cells, in particular, with the pluripotency that allows them to differentiate into various cells and organs, and their ability to proliferate almost endlessly, are expected to dramatically increase the possibilities for regenerative medicine. In recent years, there has been a significant increase in people’s average lifespan, but there has also been an increase in the number of chronic diseases triggered by cellular aging, for which no cure exists. Many people around the world are in fact suffering from chronic diseases and difficult-to-treat illnesses. 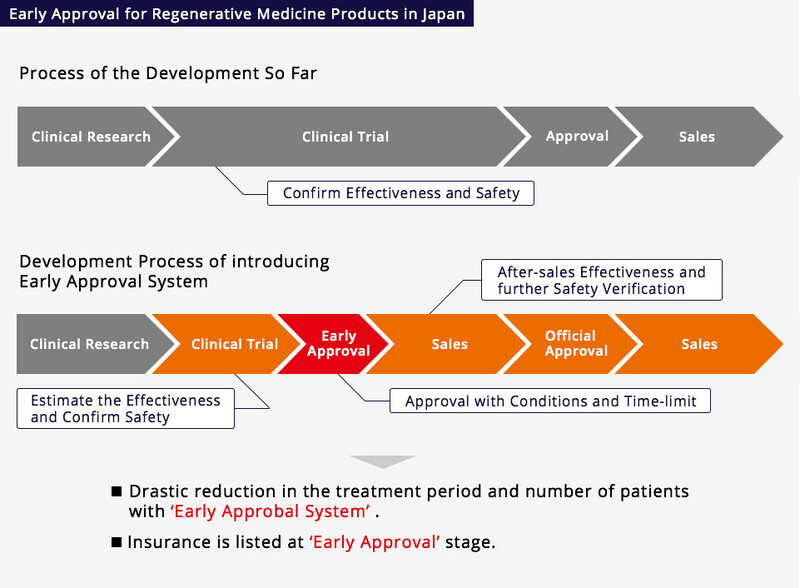 In Japan, the revised Pharmaceutical Affairs Law took effect in 2014 under the new name of the Pharmaceuticals and Medical Devices Law (The Act on Securing Quality, Efficacy and Safety of Pharmaceuticals, Medical Devices, Regenerative and Cellular Therapy Products, Gene Therapy Products and Cosmetics). This law sets up a new system to implement the rapid approval of new products, leaping ahead of the rest of the world in the regenerative medicine field. That is to say, if the efficacy of regenerative medicine products created by incubation in human cells can be presumed, and their safety confirmed, they may, subject to certain conditions and the discretion of the authorities, be granted early approval.